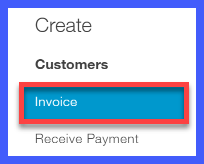 In this tutorial, we’re going to cover how to create and send invoices to your customers. Let’s begin! An invoice is a document that provides customers with a detailed description of the products or services that you have provided and how much they cost. Invoices are required for sales made on credit. In other words, if customers do not pay you at the time of the sale then you need to keep track of what they owe you so that you can ensure you receive payment in the future. Invoices help you to manage your accounts receivable. Accounts receivable is the outstanding balance that is owed to you by your customers. 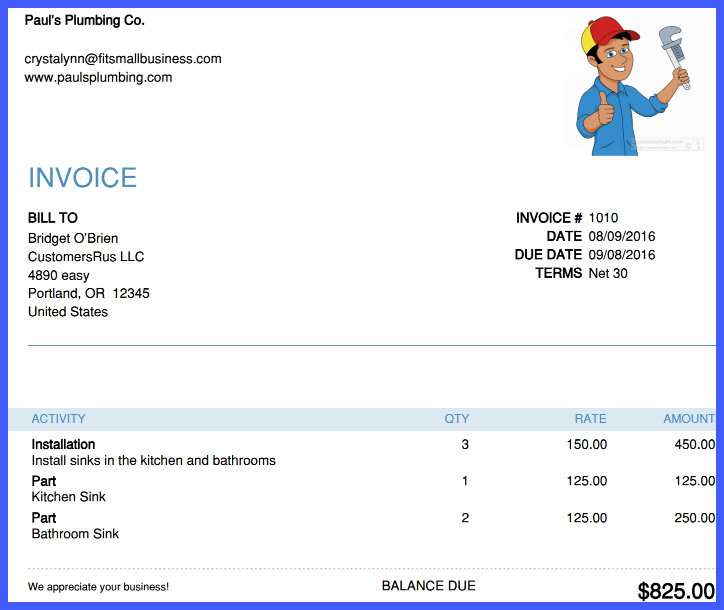 Below you will find a sample of a completed QuickBooks Online invoice for our fictitious company, Paul’s Plumbing. Why Should I Create Invoices in QuickBooks? Your financial statements are updated in real-time to reflect the change in your accounts receivable and bank account balances. 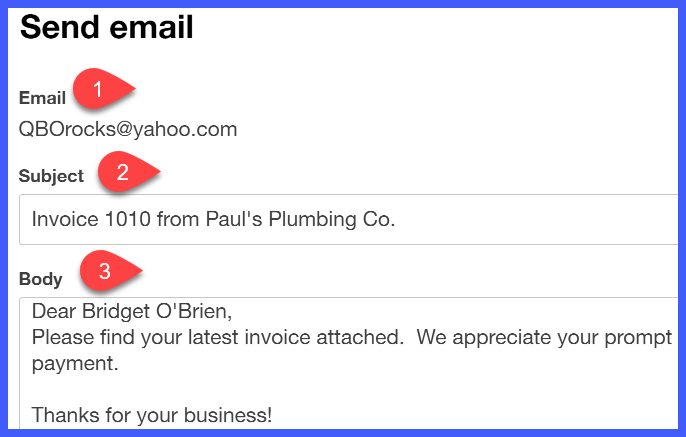 You can email invoices to your customers directly from QuickBooks. This will allow you to not only save postage but also ensure that your customer receives the invoice faster so that you can get paid faster. 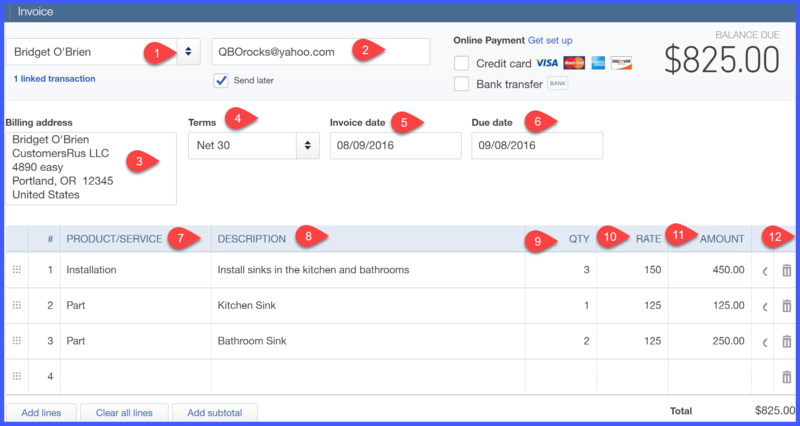 How Do I Create an Invoice in QuickBooks Online? From the Home page, below the Customers column, select Invoice as indicated below. Customer name – select the customer’s name from the drop down.TIP: If you have not set up the customer info yet, you can do so by clicking on the drop down arrow, scroll up to the top of the list and select Add New. A new window will open up that will allow you to enter your customer’s information. Once you have done this, you can click save and finish your invoice. Customer email address – this info will automatically populate from the customer profile. If you did not enter the email address in the customer profile, then this field will be blank.TIP: You can enter the email address directly in this field, and it will automatically update the customer profile. Billing address – this info will automatically populate from the customer profile. If you did not enter the billing address in the customer profile, then this field will be blank.TIP: You can enter the billing address directly in this field, but it will not automatically update the customer profile. You will have to go back to the customer profile and enter this information for it to auto-populate going forward. Terms – this is the # of days you have given your customers to pay you. This info will automatically populate from the customer profile. If you did not enter the payment terms in the customer profile, then this field will be blank.TIP: You can select payment terms by clicking on the drop down arrow in this field, and it will automatically update the customer profile. Invoice date – this is the date that you provided the product or service to your customer.TIP: Typically QuickBooks will default to today’s date. If you are creating the invoice after the date that the product or service was provided, then you will need to change this date. Due date – this date is automatically calculated based on the payment terms field. In this example, the payment terms are Net 30. That means that the due date is calculated 30 days from the Invoice date which is 8/9/2016. The due date is 9/8/2016. Product/Service – select each product/service from the drop down list.TIP: If you have not set up the products and services info yet, you can do so by clicking on the drop down arrow, scroll up to the top of the list and select Add New. A new window will open up that will allow you to enter your product and service information. Once you have done this, you can click save and finish your invoice. Description – this field will auto-populate based on the product/service you selected above. However, you can customize this description by typing directly in this field.TIP: Any custom description that you enter on this invoice will not update the description for the product and service. If you want this description to auto-populate when this product/service is selected, then you need to update the products and services info. Qty – if applicable, enter the quantity for each product or service. Rate – this field will auto-populate based on the rate you set up for the product/service selected. If you did not set up a rate, then you can enter it directly on this form.TIP: Any rate that you enter on this invoice will not update the rate for the product and service. If you want this rate to auto-populate when this product/service is selected, then you need to update the products and services info. Amount – QuickBooks will automatically multiply the quantity and the rate columns to calculate the amount. To delete an item, just click the trash can symbol in this column. Once you have completed all of the necessary fields, you can do a print preview to see what the invoice will look like. Just click the Print or Preview button at the bottom of the screen. Below is a complete sample invoice for our fictitious company, Paul’s Plumbing. After you are satisfied with the invoice, you can either print it out and mail it to your customer, or you can email it directly from QuickBooks. To email the invoice directly from QuickBooks, just click on the drop down arrow to the right of the Save and close button and select Save and send. The following should display on your screen along with a preview of the invoice. Email: this is the email address that is saved in the customer profile. Subject: this is the invoice # that was assigned by QuickBooks and your company name. You can edit this information directly on this screen. Body: This is the information that will appear in the body of the email that your customer receives. You can edit this information directly on this screen. The invoice will be attached to the email as a PDF document. Once you have made your changes, select the Save to send queue and close button as indicated below. This will then trigger the email to be sent to the customer. TIP: Be sure to check your email delivery settings before sending emails to your customers. We covered this in the tutorial on how to set up sales form content. That wraps up How to Create and Send Invoices in QuickBooks Online. In our next tutorial, we will show you How to Receive (Record) Payments from Customers, how to properly apply customer payments, and the impact this will have on your financial statements. There is no paid option still adds the cost to balance owing. How do I add a paid option to the invoice?